I mostly chose my One 2.5s because they had my Momentum shoe charms "Finish Strong" on them; always the best inspiration on race day! Pre-Race photo op with Emilie, fellow Altra Ambassador. Love repping Altra! This is one race I usually don't care too much about being in the front. It's a great race. Not too big, not too small. It's only crowded for the first 10th of a mile, then after that, you can find your pace rather easily. So I usually just hang out in the back. This time, I was definitely not ready when the cannon went off. But I quickly kissed Ward, our pre-race ritual, then off I went. The hardest part of the race is to not go out too fast. The first couple of miles are mostly downhill. This year, I had been battling a cold the entire week before the race, so I knew going into the race that it was not going tone a fast one. I just wanted a good workout. As I've run this race 6 years, I know exactly when I need to smile and be ready for David Colby of Maine Running Photos. Thank you, David! The course itself was great. The hills were exactly where they were the last 6 years. They didn't get any smaller, which is a shame. But I was ready for them. And finishing smiling is always a plus! I finished in 1:25 and change, 6 minutes shy of a PR but 6 min faster than my slowest MWC, so I'm good with this. And I didn't end up with Pneumonia like I did after the race one year. While it wasn't my fastest year, and I was FAR off from any age group placing, my husband was 3rd in his age group and scored this awesome backpack! I love the different prizes MWC hands out to the winners and AG winners each year. After the race, we went to C Salt, a cute market just beside Cape Elizabeth HS. We could smell the deliciousness as we ran past it toward the finish and had to check it out. I chose the perfect breakfast/lunch - the burrito with green tea and a blueberry Kombucha. My only question is why haven't we gone there before? We've been missing out. One more thing. I do love how MidWinter Classic has kept the same style of race shirts each year for the past few years. The simple style is something I really like, but the color this year is my all-time favorite. 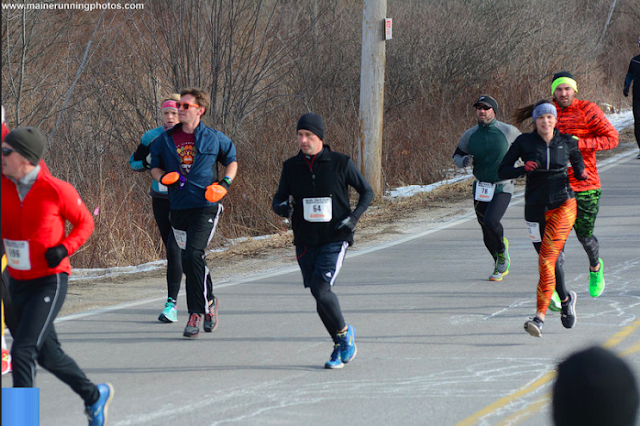 Thank you, MidWinter Classic for putting on a fabulous race each year! I am already thinking about next year's race!